Ember Spirit is a hero who is not only lethal in the early game. He also has got a big potential to be a main carry for his team. In early game, he had a dps skill and a lock down for 2 target that is so painful, especially for squishy hero like crystal maiden and so on. While in the late game he has sleight of fist that can provide thousands of damages to the enemies. Surely he needs adequate farm in the early and mid game so that he could be dangerous in the late game. You should spam this ability together with Sleight of Fist. Use Sleight of Fist first then quickly use this so while you Sleight of Fist, the enemy is bound and harassed. A perfect DPS skill and also a shield that blocks magic damage. 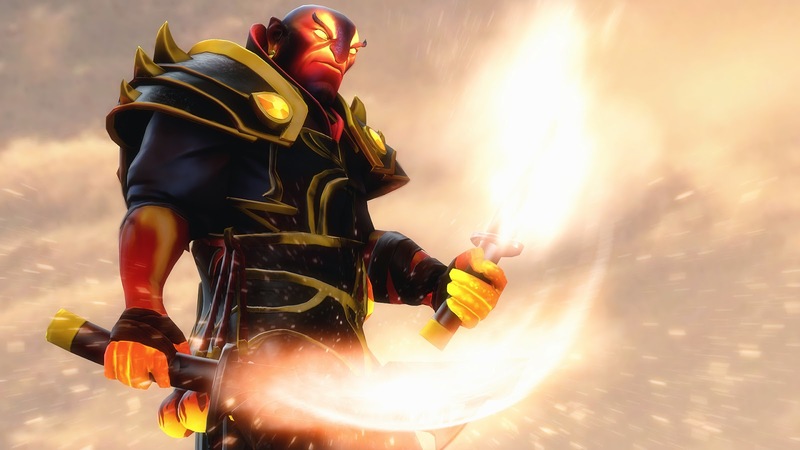 Ember Spirit generates Fire Remnant charges every 35 seconds, with a max of 3 charges. Releasing a charge sends a Fire Remnant that runs to the target location at 2.5x Ember Spirit's speed. 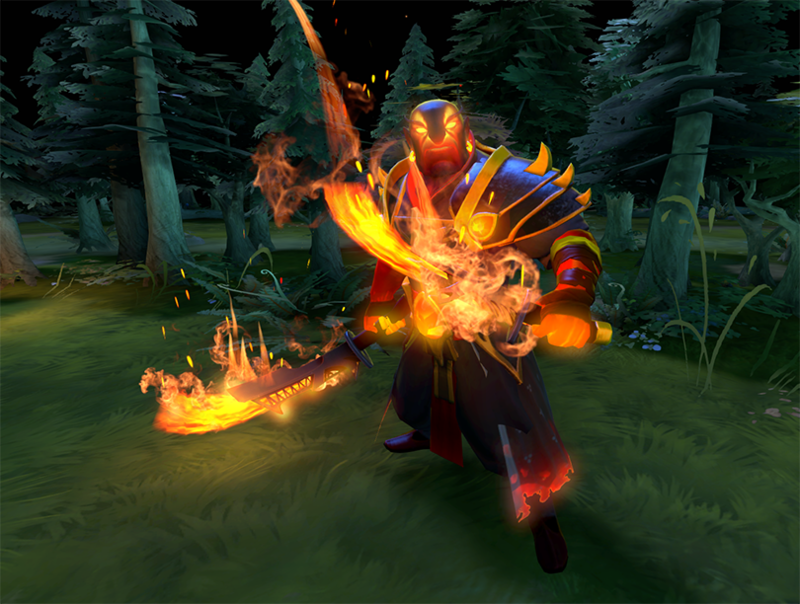 Using Activate Fire Remnant, Ember Spirit can dash out to his Remnants, exploding them for area of effect damage. The targeted Remnant will be arrived at last. Before engaging, prepare a remnant on the safe place, so you can jump to it for safety. Also prepare a remnant and then teleport back to fountain to regenerate health and mana, and then come back to remnant. Why take Searing Chains for level 1? For insurance so that we can lock down the enemy when they chase you. Why maxed Flame Guard first? This is your main nuke, you will need this for ganking, farming, and killing on early-mid game. And also don't forget about the shield that will protects you from enemy's burst damage. Why maxed Searing Chains before Sleight of Fist? The rule of DotA: Nukes for early game, physical damage for late game. Searing Chains is a nuke that will deal more damage on early-mid game. And Sleight of Fist is for physical attacks that will be the main source of damages for late game. Your main role here is farming. We recommend using a safe lane to farm. Farm rate will be maximized if you are protected by the kind of supports just like Shadow Shaman or Maiden. They will protect you from enemy harassment. Besides your team could also be more aggressive and look for first blood. If so, you can help with your Searing Chains + Flame Guard. Make sure to get enough farm in the early game, so mid game will be easier for your team. In the midgame, your FlameGuard + Searing Chains should already reached maximum damage. Because of that, so you can occasionally helps the team to ganks. And that will makes you even richer than before. Start a gank with your Searing Chains and then deal damage using your FlameGuard. If you are being ganked, escape using your Remnant. Coordinate a gank with your partner so you will make sure to get at least 1 kill. Smoke of deceit your team before the ganks. And do not forget, as a carry, your main focus is the farm, do not use 100% of time to gank. When there is an empty lane use that opportunity to farm as much gold. You can use the jungle for more leverage. For the purposes of the security in the farm, then prepare one remnant in a safe place so that you can farm a little away from your base, and when it seems some enemies who want to kill you, you can quickly move to your remnant that you've prepared in the harbor earlier . In the late game, you has the potential to carrying your team. The Sleight of Fist is your main skill here. Here you should already have all your core items ,at least you 've got Battlefury and also coupled with the high damage items like Daedlus and also Desolator so you can combine it with the Sleight of fist to make tons of damage in an area. At this time , if it happens teamfight then you should participate . Because if if not , then your team is certainly to lose . That's where the importance of the role of carry in the late game . To be the main damage dealer. 1 . There are hiding your team near your farm. That way if it comes the enemy that ganks you then your friends will be ready to ambush them. 2 . You can also farm by first preparing the remnant at the base to go back immediately if needed. Do this while your team waiting enemy to go high ground. Your team could also initiating by smoke of deceit , and 5 people should participate in it ,then with a little luck you will find an opponent who is alone and kill him with ease. And for the formation in teamfight, you should hide and after enemys are all come and drops their ultimate, you can come out and finish them. Bottle: To make you always have adequate mana and health in a teamfight. Phase Boots: Gives damage and also increase move speed by a lot. Drum: Gives survivability, mana, attack speed, and also movement speed. Battlefury: Gives cleave so if there is some enemy in an area, your sleight of fist makes you can cleave to all of them. BattleFury is stack so you can get 2-3 Fury that gives you so many cleave damage. Desolator: With your Sleight of Fist, you can reduce all of enemys armor in an area while damaging them. Daedlus: the damage from critical is very high, so it will makes your Sleight of Fist become deadly. Good article. I think Fire Remnant is always the best skill of this hero.